We’ve all heard of stress eating and at some point we’ve probably been guilty of it. When you’ve had a bad day and when the world seems to be completely on-top of you, eating an unhealthy snack can often seem like the best way to enjoy some comfort and to feel better again. The benefit of this is only short-lived however. If you’re someone who is currently trying to improve their health and fitness (which accounts for the vast majority of us) then shortly after your binge you’re likely to feel more stressed because of the calories you just consumed. In fact, stress eating can often be largely responsible for weight gain and so it’s very important to try and get it under control. Let’s take a look at exactly what stress eating is and why it happens. That way, we’ll be armed with the knowledge we need to stop this unhealthy behavior. Why Do We Stress Eat? When you get stressed, your body responds by producing a number of different hormones and neurotransmitters such as adrenaline and cortisol. The job of these hormones is to put you in a kind of ‘high performance mode’ at the cost of energy efficiency. It’s a little bit like overclocking your CPU to play a computer game that’s too good for your PC. Now your computer will perform better but there’s a risk of overheating. One of the jobs of cortisol is to help your brain use glucose more efficiently and part of this is in changing the way your body processes insulin. In other words, your body will start to quickly look for glucose and will reduce the effects of insulin. This can mess up our balance of blood sugar and often leaves us craving more after the stress has subsided slightly. Essentially you’ve taxed your body and so you’ll feel like topping up the fuel tank. What’s more, cortisol has been shown to directly encourage snacking behavior via the manipulation of hormones like leptin associated with hunger. It’s also worth noting that eating in itself is rewarding and results in the release of hormones like serotonin and even oxytocin. These ‘feel good’ hormones are designed to reward eating so that we would continue to seek out food in the wild. Today they just mean that we come to associate eating snacks with feeling good and this means we’ll be more inclined to turn to snacking as a solution when we feel low. Finally, note that stress makes us tired. And when we’re tired this actually affects our self-discipline. The self-discipline not to eat things we shouldn’t actually requires energy and as such we’re more likely to give in to temptation when we’re worn out. If you start your day with a big breakfast filled with slow release carbs and fats, then you’ll have provided your system with a steady supply of energy that it can’t ‘rush’. 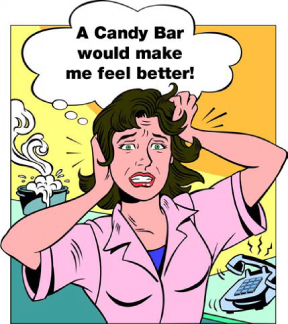 Thus, even when your stress hormones are high, you won’t be able to completely use up all the sugar in your system and this will mean you don’t end up shaky and craving treats. Another alternative is just to have a cup of tea, to snuggle up in a blanket and watch a good film, to have a warm bath with a magazine or to spend time chatting to a friend. Getting a massage from a partner is also a great option. The point is that sometimes we need to indulge ourselves to keep going – recognize this and find healthy ways to do it so you avoid stress eating. And if you really must snack, just make sure you’re picking healthier foods for your binge eating. You’ll want something sweet most likely as this is where you’ll get your sugar from – but if you choose fruits over chocolates then at least it won’t be empty calories that you’re consuming. Should You Get a Stress Ball?